Lulu has received the worst. News. EVER. She’s getting…a baby sister. No one ever asked HER opinion on this debacle. But she’ll tell you anyway, because she no how, no way, no thank you wants a sibling. 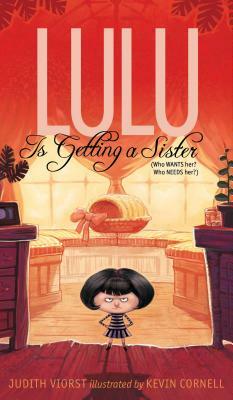 Undeterred, and to prepare Lulu for big sisterhood, her parents bribe—AHEM, ask—Lulu to attend Camp Sisterhood, a.k.a. big sister training camp. As a Sister-in-Training (SIT), Lulu is assigned a variety of temporary little “siblings” who are supposed to be so much fun Lulu will become excited to have a permanent sibling of her own. Well, no one ever said Camp Sisterhood was supposed to teach Lulu how to be a good big sister, so Lulu resolves to be a bad big sister. She insults her little siblings. She taunts them with secrets. She even tricks one of them into carrying both of their backpacks up a mountain! But no matter what Lulu does, she can’t shake the little terrors. Then some BITs (brothers-in-training) from the neighboring Camp Brotherhood start picking on Lulu’s siblings, and Lulu responds by doing her red-faced, steam-coming-out-of-her-ears thing and showing those BITs who’s boss! After all, Lulu’s siblings may be duds, but they’re her duds, and sisters have to stick together. Besides, in the end, Lulu figures that having a little sister probably won’t be as bad as a getting a tooth pulled. Probably. Lulu is not thrilled when her parents announce a baby sister will be joining their happy home, which has revolved around their spoiled only daughter’s every whim until now. In this fourth book in the “Lulu” series, which can be read independently, Lulu is quickly packed off to Camp Sisterhood where her counselor-in-chief, Call-Me-Debbie, partners Lulu with a temporary sibling so she can experience the joy of being a big sister. With authorial intrusion, the narrator lends just the right touch of humor to the main character who regularly engages in tantrums and lightbulb-bursting screeches, making an unlikable protagonist entertaining. While most SITs (Sisters-in-Training) connect with one sibling, Lulu mows through three different siblings before realizing that maybe having a little sister “isn’t as bad as getting a tooth pulled.” Lively and comical black-and-white illustrations depict a loudmouthed Lulu and her spirited antics, while short chapters and a generous use of white space will motivate reluctant readers. VERDICT Rich vocabulary and a relatable theme make this an excellent chapter book for children moving beyond beginning readers and an entertaining selection for a classroom read-aloud. Highly recommended.